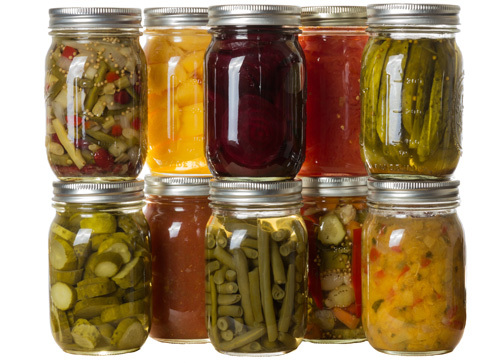 Quantity: An average of 5 pounds of beans is needed per canner load of 7 quarts; an average of 3¼ pounds is needed per canner load of 9 pints – an average of ¾ pounds per quart. Sort and wash dry beans. Add 3 cups of water for each cup of dried beans or peas. Boil 2 minutes, remove from heat and soak 1 hour and drain. Heat to boiling in fresh water, and save liquid for making sauce. 4. Place seven ¾-inch pieces of pork, ham, or bacon in an earthenware crock, a large casserole, or a pan. 5. Add beans and enough molasses sauce to cover beans. 6. Cover and bake 4 to 5 hours at 350ºF. Add water as needed–about every hour. 7. Fill jars, leaving 1-inch headspace.